Today is October 9, so that means we are 10 days away from your second birthday. Mommy is having a minor freak-out. The past two years have gone by so fast, I am sure someone has messed with the space-time continuum or something. (Mommy and Daddy are geeks, sorry.) Yesterday we went to Chase and Tyler Bischoff's birthday party, Isabella and Payton's parties were in August, and next comes you and Graham Ghio. 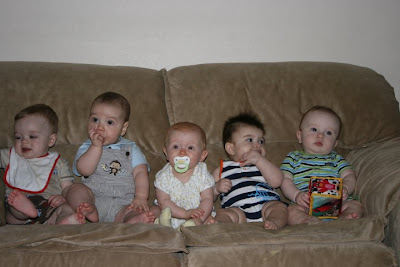 All of those little precious bundles of baby are now grown up, opinionated, running-around toddlers. Two year olds. Whoa. Yesterday I took a photo of the group of you (minus Pay, so at your party, we need to rectify that...) that made me stop. A year and a half ago, I took the same photo, so it was such a shock to see the same line up (for the most part) 18 months later. The changes in your baby faces were enough to make me get a little teary, but thankfully the camera was to my face, so no one noticed. I wish I had been able to remember the original order in which you were all sitting; that would have been really cool. But as it stands, this is a really neat series of photos. I just need time to stop going by so quickly. Pretty soon we'll have a photo of all of you lined up in tuxes and a dress (for Issa) going to prom. We're pretty lucky to have this group of friends, and it's amazing to watch all of you grow and change. Just not too fast, ok?